500 shades of autumn in a new Holiday Jigsaw! 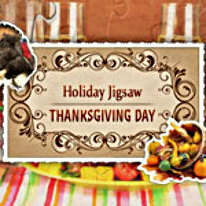 We want to thank all those who love the Holiday Jigsaw game series, and we've made this sweet and upbeat game especially for them. And to new players,we say: join us, and celebrate every new holiday with our Holiday Jigsaws! The warmth of a cozy hearth, a family holiday dinner, children's laughter and cute pets. All of this awaits you in a new Holiday Jigsaw! 500 amazing and pleasant Thanksgiving Day pictures! Enjoy high quality images, convenient controls and help, and heaps of clues and tools to help you configure the game to your liking. Special tasks and trophies make the game even more entertaining.500 new photos means 500 ideas for a party food and decorations on Thanksgiving Day! -Optional game difficulty control. Infinite gameplay!